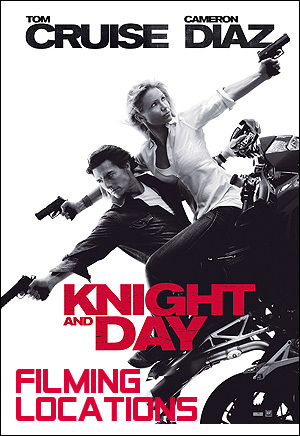 the 2010 movie "Knight And Day" was filmed. At first glance, it doesn't appear that any part of "Knight And Day" was filmed in Southern California. The film is shot all over the world (including Austria & Spain), but L.A. is nowhere to be seen. In the scene, we see Tom Cruise & Cameron Diaz riding a motorcycle over a bridge. They have just left a bull ring in Pamplona, so we're supposed to assume that they are still in Spain. Ignore the buildings seen behind the bridge. They're fake - added using CGI. But do pay attention to the light poles to the left, in the screencap below. They're real. Where are we, really? Well, here's a photo of the same bridge, that I shot in 2011. 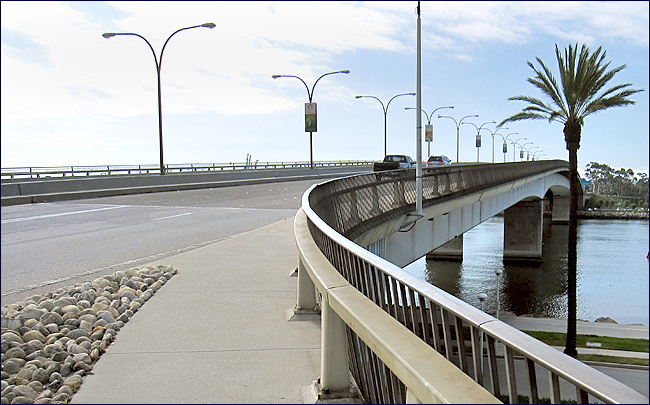 That bridge is none other than the Queensway Bridge, in Long Beach, CA. out to a pier where the historic ocean liner, the Queen Mary, is permanently docked as a tourist attraction. Tom is driving east/northeast across the bridge, heading towards downtown Long Beach. That street the car is driving on? It's not even a real street. 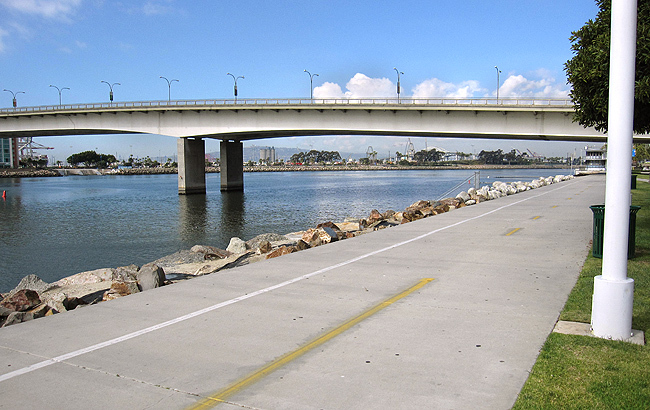 It's actually just a Long Beach bike path running along the bank of the Los Angeles River. Yes, that's the Queen Mary, across the channel. Tom then jumps down from the bridge onto the land below, and swings down onto a small dock. As you can see, it's also right on the bike path, just a few yards away from the Queensway bridge. 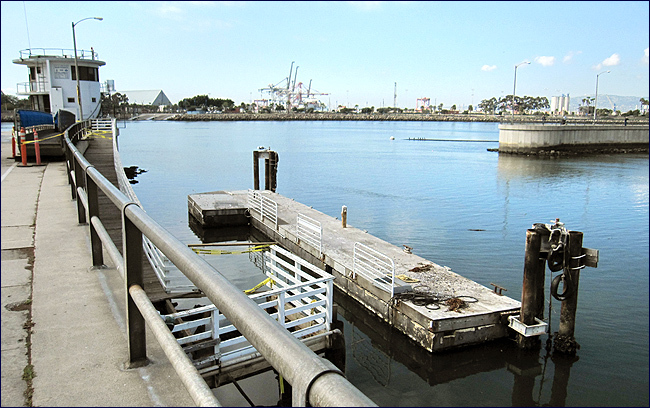 "City of Long Beach Maintenance and Development - Parks, Recreation and Marine". It's located at the Golden Shore marina, where the terminal for the Catalina Island cruise boats. 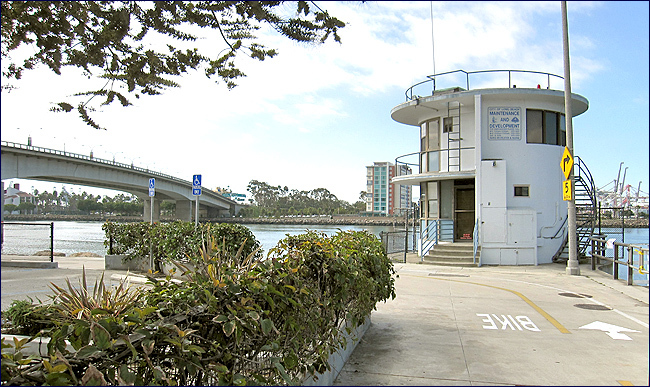 In fact, the rest of the scene all takes place at the south end of the Golden Shore marina. but is separated from those popular attractions by the northeast end of the Queensway bridge. because that same 322 address is used for many of the businesses at this Golden Shore marina. other side of the opening where boats pass from the Golden Shore/Catalina marina to the L.A. River channel. The two structures stand like sentinels on each side of that breakwater opening. Tom then confronts the bad guy down on the small dock. Behind Tom, in the screencap below, you can see a tall red, white & blue building, across the water. 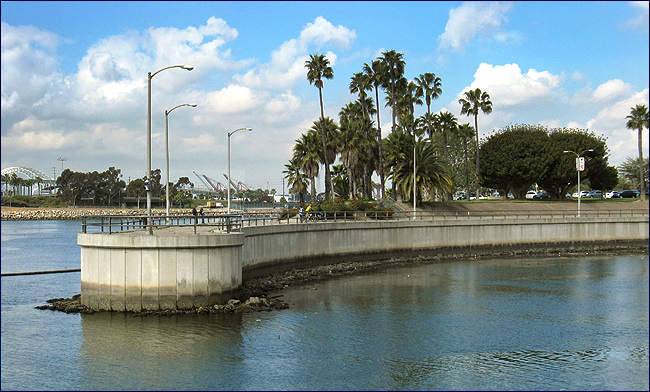 located on the other (southwest) side of the river, at 600 Queensway Drive, Long Beach, CA. 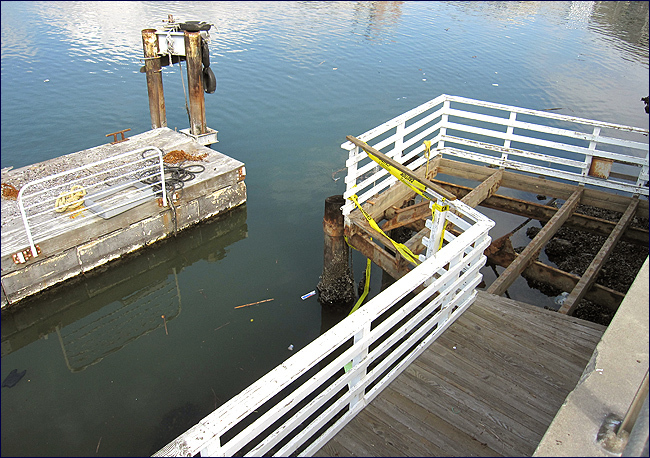 And what about that dock itself, where the bad guy holds the savant hostage? at the south end of the Golden Shore marina. Finally, shortly after the bad guy's plane takes off, it explodes. Click on the links below to see an aerial map showing all of these locations. The photos on this page are stills from the DVD of "Knight & Day"